of Our Age of Discovery"
Professor Goldin was the founding Director of the Oxford Martin School from 2006 to 2016. He is currently Director of the Oxford Martin Programme on Technological and Economic Change. He was Vice President of the World Bank (2003-2006) and earlier Director of Development Policy, playing a pivotal role in research and strategy agenda, and leading the Bank's collaboration with the UN as well as with key countries. From 1996 to 2001 Ian was CEO of the Development Bank of Southern Africa and served as an advisor to President Nelson Mandela. He succeeded in transforming the Bank to become the leading agent of development in the 14 countries of Southern Africa He was also Finance Director for South Africa's Olympic Bid. 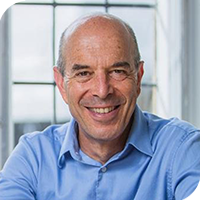 Ian Goldin has received wide recognition for his contributions to development and research; he was knighted by the French Government and nominated Global Leader of Tomorrow by the World Economic Forum.